Navigating an academic career is a complex process - to be successful requires mastering several 'rites of passage.' This comprehensive guide takes academics at all stages of their career through a journey, beginning at graduate school and ending with retirement. 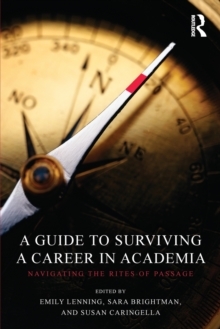 A Guide to Surviving a Career in Academia is written from a feminist perspective, and draws on the information offered in workshops conducted at national meetings like the American Society of Criminology and the Society for the Study of Social Problems. Through the course of the book, an expert team of authors guide you through the obstacle course of finding effective mentors during graduate school, finding a job, negotiating a salary, teaching, collaborating with practitioners, successfully publishing, earning tenure and redressing denial and, finally, retirement. This collection is a must read for all academics, but especially women just beginning their careers, who face unique challenges when navigating through these age-old rites of passage.